Electric cars are powered by electricity which is provided by the onboard battery. The electric car does not directly depend on fossil fuels because electricity can be generated by a variety of sources. With the current Dutch energy mix, electric cars emit already less CO2 compared to a combustion car. The compact electric cars which are developed at the moment have a range of 200 to 300 kilometers on a full battery. The battery of the electric car can be charged by the home electricity grid or by charging poles situated at parking lots. The use of electricity instead of gasoline has consequences on the environmental impact of the electric car. The environmental impact can be described by the CO2 production per kilometre. Besides, the environmental impacts related to the battery of the electric car are an important aspect because electric cars require large batteries. The European Union decided that the CO2 emission of combustion engines should be reduced to 130 grams per kilometre by 2012. At the moment, the CO2 emission of an average Dutch car is 150 grams per kilometre. The efficiency of the production process of oil is 83%, which further increases the well-to-wheel CO2 emission per kilometre. According to Milieucentraal (Dutch website), road traffic is the main cause of small particles (PM10) and air pollution such as sulphur oxides (SOx), mono-nitrogen oxides (NOx) and ozone in the Netherlands. Furthermore, combustion driven cars emit their exhaust gases directly in the urban environment, which results in air pollution, smog and contributes to global warming. Several studies describe the relation between living next to a busy road and the increased risk on lung- and respiration diseases. The majority of the electricity produced in the Netherlands comes from power plants which are supplied by natural gas. Other power supply sources come from electricity from coal powered plants, sustainable energy sources, nuclear energy, oil and other sources (Figure 1). 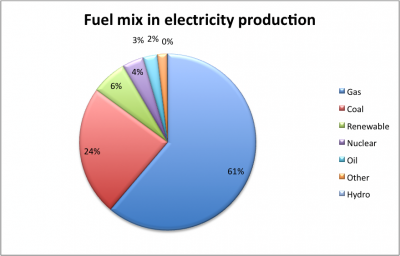 The CO2 production related to a certain amount of produced electricity depends on the method of electricity production. Electricity produced from sustainable sources such as wind and water causes ,for example, little CO2 emission while electricity from coal fired power plants results in a relatively high CO2 emission. According to Dutch electricity companies, the average CO2 emission per kWh in the Netherlands is 450 gram. An electricity grid efficiency of 92% and an electric car efficiency of 130 Wh per kilometre results in a well-to-wheel CO2 emission of 60 gram per kilometre. The CO2 emission of the electric car can be further reduced by an increased efficiency of the electricity production process and an increase of sustainable produced electricity. Power plants cause less health risks (Dutch website) because the emissions from the high chimneys do not result in direct air pollution in the urban environment. Compared to combustion cars, a power plant is better capable of cleaning their emissions by using air filters. Figure 1: Dutch electricity production (2005). Source: Energieraad. Electric car producers already guarantee a battery lifetime of 160,000 kilometre for batteries of electric cars which are put on the market at the moment. For the average Dutch car driver, who drives 15,000 kilometre annually, a battery lifetime of 160,000 kilometre will last approximately 11 years. Improvements in battery technology and battery management systems are expected to increase the battery lifetime further. The Lithium-ion polymer batteries which are used in electric cars nowadays are relatively environmentally friendly because they contain no heavy metals or other toxic compounds. Opposite to Zinc-acid batteries, the Lithium-ion polymer batteries are not considered to be toxic waste because they do not contain toxic compounds. The Lithium-ion battery is completely recyclable and the costs related to the recycling process need to be included in the new price of the car. 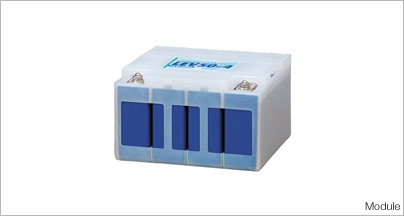 The old battery contains valuable components which can be reused for other purposes. When electric cars are implemented on a large scale, the recycling process of the Lithium-ion batteries will provide a good economic opportunity for an entrepreneur. Another possibility is to use the former electric car battery as a stationary electricity storage station. If the capacity of an electric car battery is not suited anymore for use in a car (20% reduction) it can serve as a stationary electricity storage station. Considering the environmental impacts, the electric car is a better alternative than the car with a combustion engine. 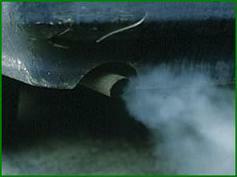 The CO2 emission per driven kilometre of electricity is significantly lower than the CO2 emission of a combustion car. The CO2 emission of the electricity production process can be further reduced by increasing the percentage of sustainable produced electricity. The Lithium-ion polymer battery which is used in the current electric cars does not contain heavy metals. The large batteries which are used in electric cars offer opportunities for a large scale battery recycling process. Another possibility is to use the former car battery as a stationary storage station for electricity when the car battery is not powerful enough anymore for use in the electric car. Great article! It explains in detail all the advantages brought by electric vehicles. The revolution against combustion and polluting engines has just begun but we’re on the right way!